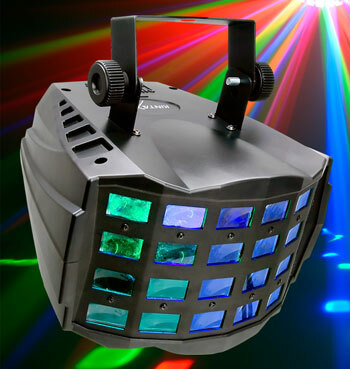 With three high-powered 3-watt LEDs, this popular fixture comes with pre-programmed shows that will fill a room with 135-degree wide floor coverage of nearly limitless combinations of red, green and blue. Thanks to LED technology, its space-saving size of 280mm x 297mm x 254mm and weight of only 2.7 Kgs allow for easy transporting and storage. Another benefit of LED technology means the Kinta™ X is a cool fixture that can go where heat must be minimized and duty cycles are a thing of the past.